Posted byAnn-See Yeoh	 November 5, 2011 Leave a comment on You Matter! Do you ever have days when life seems to get too much? That you feel undervalued, unloved, uncared for? 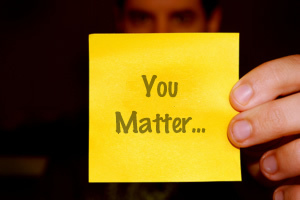 Do remember, you do matter, and what we need to know is that we need to know and believe it. When we truly believe, then the other stuff, is small stuff.